Photo of Arisa Cox at the 2017 Canadian Screen Awards © 2017 by Ralph Lucas. Used with permission. (March 8, 2017 – Toronto, ON) Last night was the first night of the Canadian Screen Awards, which are administered by the Academy of Canadian Cinema and Television. Held at the Westin Harbour Castle’s Convention Centre in a ballroom capable of holding 1000 guests, the room seemed packed as producers, directors, writers and talent involved in the production of non-fiction television (news, sports, documentary, lifestyle, factual and reality categories) gathered to celebrate their work and each other even though in these sorts of affairs the night will produce few winners compared to the impressive list of nominees. 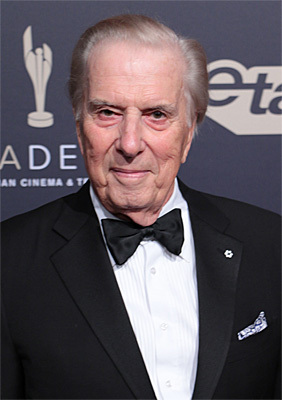 Photo of Lloyd Robertson at the 2017 Canadian Screen Awards © 2017 by Ralph Lucas. Used with permission. Other high profile news anchors at last night’s event included CBC’s Peter Mansbridge and Heather Hiscox and CTV’s Lloyd Robertson. All three were presenters during the show, which was not televised. Best reportage, national: CBC News: The National — Trapped at the Border. Best news or information segment: CBC News: The National — Catching Up with the Farwans. Best live sports event: Rio 2016. ​Best science or nature documentary program or series: Moose: A Year in the Life of a Twig Eater. Best factual program or series: Still Standing. Best local newscast: CBC News: Here and Now. Best national newscast: CBC News: The National​. Best host in a lifestyle, talk or entertainment news program or series: Jonny Harris, Still Standing. Best live entertainment special​: The Tragically Hip – A National Celebration. Best news or information program: CTV’s W5 for Healing Hands. Best biography or arts documentary program or series: HBO Canada’s Hip-Hop Evolution. Best documentary program: TVO’s My Millennial Life. Best national news anchor: Lisa LaFlamme, CTV National News with Lisa LaFlamme. Best sports play-by-play announcer: TSN’s Chris Cuthbert for the 2015 Grey Cup. Best news or information series: Discovery Channel’s Daily Planet. Best talk program or series: CTV’s The Marilyn Denis Show. CTV’s The Amazing Race Canada earned five Canadian Screen Awards for photography, editing, writing and directing achievements. It also won best reality/competition program or series, the night’s final prize. Documentary filmmaker and journalist Simcha Jacobovici was presented with the special Gordon Sinclair Award for Broadcast Journalism. The filmmaker was visibly moved by the honour when he received a standing ovation. Rob Stewart, the Canadian documentarian who died while shooting a sequel to Sharkwater, was given a moment of recognition during the documentary awards segment last night. The CSAs continue tonight with a gala for creative fiction content, including drama, children’s and youth programming, comedy and variety categories. The Broadcast Gala on Sunday night will see the awards for film and the remaining television show awards. Hosted by comedian Howie Mandel, the Broadcast Gala will be carried on CBC-TV starting at 8 p.m. ET.